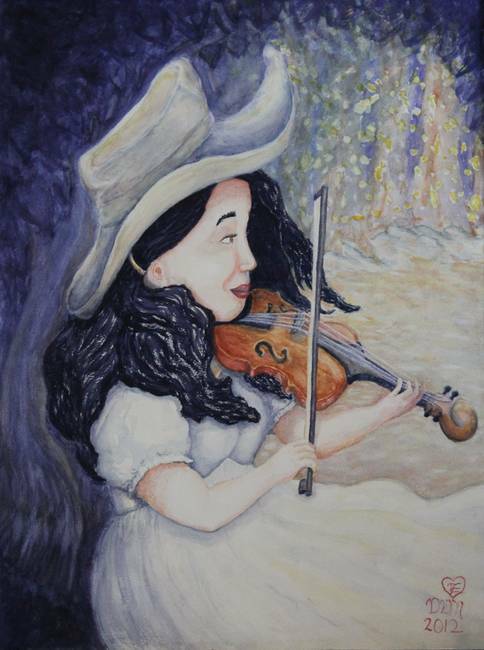 A country girl in a white dress and cowboy hat pauses to listen to the sound of the wind before continuing to fiddle a serenade. Autumn leaves fall peacefully downward through the dark, but tranquil forest in the background, as their silently drifting shapes create an air of magical wonder —glowing in the light in their downwards spiral towards the forest floor. As the wind flutters her dress and her hair, it also picks up the notes of her music from her inward ear, and carries them afar to the world. Archival inks and papers, canvas prints,custom framing available on imagekind Fine Art Prints from $10.44 and up. Prices subject to change. Woman’s Autumnal Twilight Serenade on RedBubble cards starting at US $2.40, photographic prints US$6.60+, matted, mounted, canvas, framed, posters, shirts, stickers, iPhone & iPod cases prices subject to change. I first got the idea for this painting when I was cleaning up some gentian violet that spilled all over the bathroom counter. I made the mistake of setting the wadded up cloth diaper which was used in the cleanup on the edge of the bathtub–which just made a bigger mess; however, when it was removed later I noticed the stain left behind resembled a cowboy hat, and upon closer inspection I saw a cowgirl playing a fiddle in my imagination. There are photos of the stain in my facebook album also. I took a bunch of photos of the stain from all sorts of angles , and set them aside to use as a reference later before cleaning the whole thing up with a bleach spray. Then when my friend Heather suggested I should enter the competition, I thought this would make a great painting for my entry. With a bit of a folksy feel, this painting has come to have a spiritual meaning to me. The wind can be symbolic both of trials and of the Spirit. Notice that the Tree in the background looks gnarled and weathered and bent by the winds that have beset it. We are like that sometimes, our past and the trials we’ve been through sometimes they make us feel all gnarled up inside, and we have to move beyond that and find healing. the leaves falling and glinting in the light symbolize change and the beauty of shedding the old so we can put on beautiful and tender new growth when after the process of weathering the winter season. The woman in the painting appears to have found a moment of peaceful clarity as she listens to the sound of the wind (or the Spirit)– then after listening she begins to play what she has heard, what she has learned, so that the wind can then brighten lives by carrying its message through her music to the hearts of listeners throughout the world.